김동일 2016. How to Identify Climate Obligation Bearers. Journal of Ethics, Vol. 1, Issue. 107, p. 103. Caney, Simon 2015. Political Theory Without Borders. p. 18. Caney, Simon 2014. Two Kinds of Climate Justice: Avoiding Harm and Sharing Burdens. Journal of Political Philosophy, Vol. 22, Issue. 2, p. 125. 1 Jeffrey Marlow, “E.U. Looks to U.S. for Climate Leadership,” New York Times (online edition), June 3, 2009. 2 Elisabeth Rosenthal, “UN Chief Seeks More Climate Change Leadership,” New York Times (online edition), November 18, 2007. 3 Karlsson et al. examine the “demand side” of climate policy leadership by surveying perceptions of potential leaders but stop short of proposing strategies for inducing such leadership. See Karlsson, Christer et al. , “Looking for Leaders: Perceptions of Climate Change Leadership among Climate Change Negotiation Participants,” Global Environmental Politics 11, no. 1 (2011), pp. 89–107. 4 See, e.g., Krosnick, Jon A. and Kinder, Donald R., “Altering the Foundations of Support for the President through Priming,” American Political Science Review 84, no. 2 (1990), pp. 497–512. 5 Shue, Henry, “Face Reality? After You!—A Call for Leadership on Climate Change,” Ethics & International Affairs 25, no. 1 (2011), p. 17. 6 See, e.g., Repetto, Robert, America's Climate Problem: The Way Forward (New York: Routledge, 2011). Also, see notes 1 and 2. 7 Shue, “Face Reality?” pp. 19–20. 8 See Vanderheiden, Steve, “Leadership, Moral Authority, and Global Climate Change,” in Hicks, D. A. and Williamson, T., eds., Leadership and Global Justice (New York: Palgrave Macmillan, 2012), pp. 80–82. 9 Hall, Rodney Bruce, “Moral Authority as a Power Resource,” International Organization 51, no. 4 (1997), p. 597. 10 Parsons, Talcott, Sociological Theory and Modern Society (New York: Free Press, 1967), p. 308. 11 United Nations Framework Convention on Climate Change, art. 3, principle 1 (New York: United Nations, 1992). 12 Gardiner, Stephen M., A Perfect Moral Storm: The Ethical Tragedy of Climate Change (New York: Oxford University Press, 2011), chap. 1. 13 U.S. Department of Energy, Carbon Dioxide Information Analysis Center; cdiac.ornl.gov/. 14 Hardin, Garrett, “The Tragedy of the Commons,” Science 162, no. 3859 (1968), pp. 1243–48. 15 After specifically naming China, India, Mexico, and Brazil among developing countries excluded from binding emissions targets under Kyoto Protocol terms, the Senate resolved that “the United States should not be a signatory to any protocol to, or other agreement regarding, the United Nations Framework Convention on Climate Change of 1992, at negotiations in Kyoto in December 1997, or thereafter, which would (A) mandate new commitments to limit or reduce greenhouse gas emissions for the Annex I Parties, unless the protocol or other agreement also mandates new specific scheduled commitments to limit or reduce greenhouse gas emissions for Developing Country Parties within the same compliance period, or (B) would result in serious harm to the economy of the United States.” In defending his 2001 decision to formally withdraw from the protocol, President George W. Bush echoed the same two concerns. 16 Goodin, Robert E., “Excused by the Unwillingness of Others?” Analysis 72, no. 1 (2012), pp. 18–24. 18 As I have argued elsewhere, fair terms of cooperation are essential features of an effective climate treaty as necessary conditions for all parties to voluntarily accept their roles in it. See Vanderheiden, Steve, Atmospheric Justice: A Political Theory of Climate Change (New York: Oxford University Press, 2008). Here, one might add that unfair terms also diminish the moral authority of leadership wielded on behalf of initiating such a treaty framework. 19 Arneson, Richard J., “The Principle of Fairness and Free-Rider Problems,” Ethics 92, no. 4 (1982), pp. 622–23. 20 This analysis considers the incentive effects of merely pledged reciprocal cooperation, though not of conditional commitments to increase efforts if others join in the cooperative scheme. Underval et al. have modeled the effects of the EU making a conditional commitment to cutting its emissions by 30 percent rather than the 20 percent to which it has already committed, and found that such a commitment would significantly lower the costs for other nations (the United States, Japan, India, and China) to respond with stronger reciprocal commitments, even if it could not guarantee such a result. See Underdal, Arild et al. 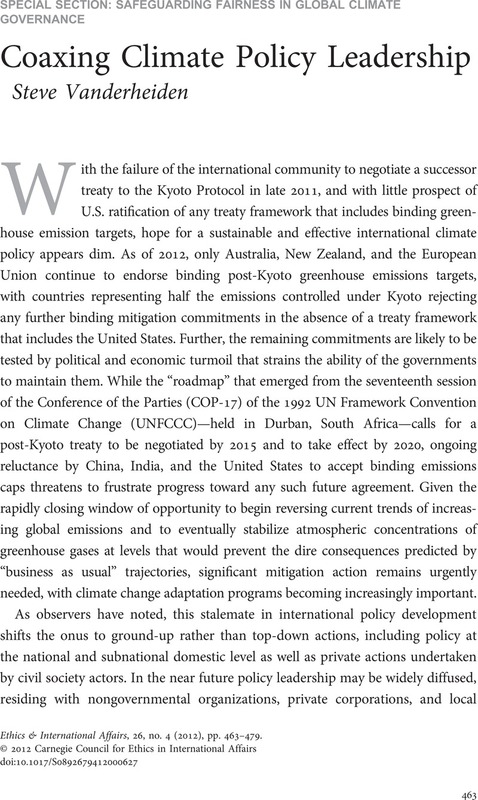 , “Can Conditional Commitments Break the Climate Negotiations Deadlock?” International Political Science Review 33, no. 4 (2012), pp. 475–93. 21 The EU, for example, has unconditionally pledged a 20 percent reduction from its 1990 emissions by 2020, but has conditionally promised a 30 percent reduction by that date if other developed countries take on similar commitments. Likewise, Australia has unconditionally committed to a 5 percent reduction from 2000 emissions by 2020, but conditionally committed to a 25 percent reduction if a global climate agreement is reached that stabilizes atmospheric carbon at 450 ppm or lower, and to a 15 percent reduction if that agreement falls short of the 450 ppm target. Copenhagen Accord, Appendix 1; unfccc.int/meetings/copenhagen_dec_2009/items/5264.php. 22 Ward, Hugh, “Game Theory and the Politics of the Global Commons,” Journal of Conflict Resolution 37, no. 2 (1993), p. 229. 24 Shue, “Face Reality?” p. 23. 25 See, e.g., Oberthür, Sebastian, “Global Climate Governance after Cancun: Options for EU Leadership,” International Spectator 46, no. 1 (2011), pp. 5–13; and Kilian, Bertil and Elgström, Ole, “Still a Green Leader? The European Union's Role in International Climate Negotiations,” Cooperation and Conflict 45, no. 3 (2010), pp. 255–73.